MESA, Ariz. – The University of Antelope Valley Pioneers (6-11; 4-1 Cal Pac) earned their fourth conference win on Saturday afternoon, handily defeating the Redhawks of Benedictine University at Mesa (13-7; 2-3 Cal Pac), 92-75, in intercollegiate California Pacific Conference men’s basketball action inside Heap Gymnasium. 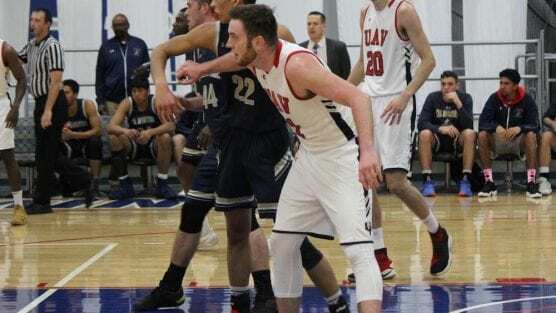 UAV controlled the pace of the first half and led 48-29 at the intermission, and despite being outscored by the Redhawks in the second half, UAV’s large advantage would prove to hold strong as they cruised to a 17-point victory, 92-75. Senior forward Christian Drayton (Lufkin, TX) collected his tenth double-double of the season, scoring a team-high 19 points and pulling down a game-high 12 rebounds, junior guard Kamal Holden (Los Angeles, CA) added 14 points, six rebounds, two steals and one block, junior forward Kane Keil (Auckland, New Zealand) finished with 13 points, five boards and three assists, and junior center Deividas Mockaitis (Kaunas, Lithuania) dropped 11 points, eight rebounds and blocked three shots. UAV hit 32-of-67 field goals (.478), 8-of-23 three-pointers (.348), 20-of-25 free throws (.800), and outrebounded the Redhawks, 47-34. UAV committed 15 turnovers and stole the ball seven times. BENU made 24-of-62 shots (.387), 7-of-25 three-pointers (.280) and 20-of-24 free throws (.833) and committed 14 turnovers and stole the ball from UAV six times. NEXT GAME: Coached by Darwin Cook, the Pioneers return home to host Simpson University for California Pacific Conference contest on Thursday, Jan. 17 at 7:30 p.m. PST inside the Pioneer Event Center (PEC) in Lancaster, Calif.